So after this incredibly interesting tour of La Maison Radieuse with Bernard & Christine (and Claire!! ), we got to go into one of the actual apartments in the building. A colleague of Bernard’s lives there and so we went in for a little tour / glass of wine / taste of cheese. His name is Manu and he turned out to be very interesting. Not only is he an artist (he showed us the studio space he shares with others and their various silk screening projects), he has great taste in music. As cool as his apartment is, the first thing I noticed was his copy of Swordfishtrombones, the absolute classic Tom Waits record from 1983. Not only that, it was on vinyl. Not only that, Manu has a turntable. 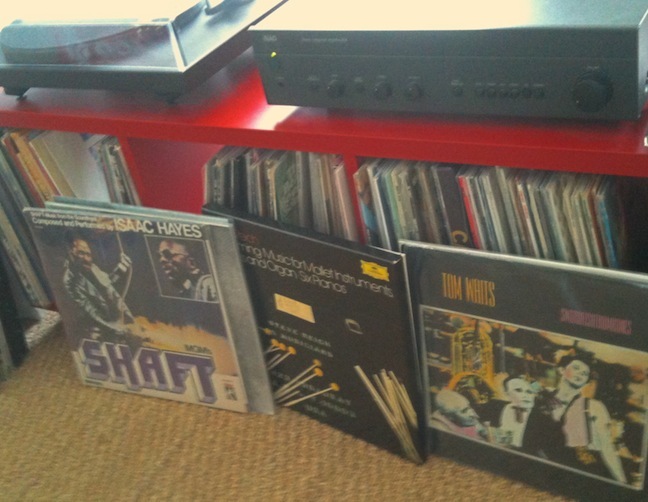 Not only that, he put the vinyl copy of Swordfishtrombones on the turntable. Not only that, he played it. Music came out of these wooden boxes. Manu and I speak the same language. The language of Tom Waits. Corbu + Waits = cool. No, really cool! Especially the Corbu part! And the Waits part! Especially the Waits part! Imagine finding someone with your taste in music – in France, no less! How fun. I love the silk screen – be better if it were dogs.